Bermuda’s first cardiac-rehab and heart-health education center is transforming people’s lives. 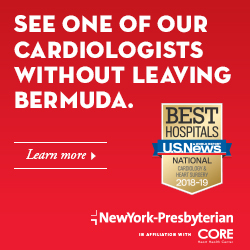 Since opening its doors in February 2011, the Bermuda Heart Foundation’s Cardiac Outreach, Renewal and Education Center (CORE) has helped more than 150 people who suffer from heart conditions or are at risk of developing them. The results speak for themselves: as a group, those who have completed the center’s eight week programme have reduced overall blood sugar levels by 90%, blood pressure levels by 95%, and made a start to weight loss averaging 7 to 10 pounds. CORE is the island’s first one-stop resource for heart-health issues. A doctor can refer anyone who has had a heart attack or is at risk for heart disease. The center has a nutritionist, a psychologist, a well-equipped gym run by a cardiac-fitness specialist and a cardiologist, Dr. Varinder Singh, who visits once a month from New York Presbyterian Hospital, CORE’s “big sister” organisation. The link with New York Presbyterian, and through it to Dr. Oz of TV fame who produced a two-minute commercial for the center, has been tremendously helpful in getting the facility up and running. “We are very honoured to be linked to such a great, established facility,” says Barton. The eight-week program is a huge commitment. Participants undergo a psychological and physical assessment before they start, and they must use the center’s gym to exercise three times a week. There are weekly educational classes on issues such as stress management, healthy cooking and menu planning. The clients represent a cross-section of Bermuda society, including men and women of all ages, starting from as young as 16. Most have heard about the center through word of mouth and asked for a referral. The center’s prevention and rehab services are an insurable benefit, which makes the program affordable. Without this, CORE could not function, explains Barton. “Insurance companies in most countries wait until you are laid up in a hospital bed costing thousands of dollars, whereas in Bermuda they have said, let’s get out in front of it. Argus, Colonial and BF&M really need to be saluted for that, because it could not happen without them.” Clients do pay a portion of the cost, as far as they are able. That is a good thing, says Barton, because making a monetary commitment means they do not take the services for granted. As a charity, all fees charged by the Bermuda Heart Foundation for CORE’s services go back into the center, which receives no Government funding. Thanks to major sponsors, including ACE, Allied World, Aspen, Bacardi, Endurance, PartnerRe, XL and Argus (which pays for one member of staff), the center is managing, but urgently needs additional staff to handle the growing number of clients. For more information, go to www.mybermudaheart.bm. Cardiovascular disease remains the number one cause of death in both men and women worldwide. The clinical manifestations of cardiovascular disease are stroke, heart attack, irregular heartbeat (known as arrhythmias) and poor blood flow to the legs or kidneys. The symptoms of cardiovascular disease include chest discomfort, shortness of breath, fatigue, pain in the legs when walking or uncontrolled high blood pressure. The keys to a good prognosis in cardiovascular disease are early detection and symptom recognition. There have been great advances in both detection and treatment of cardiovascular disease in the past decade. Those at high risk from common risk factors, such as high blood pressure, diabetes, smoking, high cholesterol and a family history, or those with symptoms should start with an evaluation by a cardiologist. Commonly, patients may be referred for EKG, echo and stress testing to confirm the diagnosis of cardiovascular disease. These tests have been the mainstay of diagnosis, but in the past decade, advances in CT scanning have made the diagnosis easier and more accurate. Cardiac CT scans offer the ability to delineate noninvasively the amount of plaque build-up in the heart arteries. If these scans show no or minimal plaque, then the patient’s risk for a cardiac event is low. If the CT scan demonstrates significant plaque, then the patient’s risk is higher. Fortunately, there have been great advances in the treatment of cardiac disease in a minimally invasive manner. The most common procedure to determine the extent of the disease is a cardiac angiogram, also known as cardiac cath. Cardiac cath is a common procedure where a catheter is inserted via the wrist or the groin, and dye is injected into the heart arteries. The location and severity of the blockage is then confirmed. In the past, severely blocked arteries were treated with open-heart surgery, but with the advent of angioplasty techniques and modern-day stents, most of these blockages can be treated during the cardiac cath. A balloon travels through the catheter and breaks the plaque. This opens the artery and allows for the placement of a stent. Stents are wire-mesh tubes that are placed at the site of the severe blockage and serve to diminish the recurrence of the blockage. The patient is discharged the following day and can resume routine activities immediately. In advanced cases of artery blockage or with severe valve disease, patients are still treated with open-heart surgery. Open-heart techniques have also advanced toward a minimally invasive approach, and many of these surgeries can now be performed with small incisions that are less traumatic. This allows for an easier and more rapid recovery without sacrificing outcomes. The most recent minimally invasive advance has been in the treatment of valvular disease. In cases where heart valves (the doors that allow blood into and out of the heart) become blocked, patients can now have these treated via a catheter. In the past, these valves could only be treated with traditional open-heart surgery. The damaged valve can be treated by placing a new valve or clip via a catheter. Again, this leads to significantly decreased trauma without sacrificing good outcomes. Regular exercise, an active lifestyle and medications are essential to avoiding and treating cardiovascular disease. The CORE Heart Health Center is an integrated center that offers nutritional and exercise counseling, which is covered by most insurance. The center also offers expert consultative care with physicians from New York Presbyterian Hospital in New York. herapy, Columbia University-New York Presbyterian Hospital. Diseases of the circulatory system are the leading cause of death in Bermuda. In 2006, circulatory diseases accounted for 41% of all deaths in Bermuda. Here are some tips from the American Heart Association to help you be heart-smart at the grocery store and choose good-for-you foods. Be sure to buy and eat plenty of fresh or frozen fruits and vegetables. Fruits and vegetables that are deeply coloured throughout—such as spinach, carrots, peaches and berries—tend to be higher in vitamins and minerals than others, such as potatoes and corn. When fresh foods aren’t available, choose frozen or canned vegetables and fruits in water without added sugars, saturated and trans fat, or salt. Buy fruits and vegetables that are good sources of fibre, including beans, peas, oranges, bananas, strawberries and apples. Stock up on raw vegetables for snacks such as carrot and celery sticks, broccoli, cherry tomatoes and cauliflower. For desserts, buy fresh or canned fruits (in water without added sugars), dried fruit (without added sugars) and gelatin that contains fruit, instead of baked goods and sweets. Don’t buy lots of fruit juice. It doesn’t provide the fibre whole fruit does, and it’s not as good at satisfying hunger. Some cholesterol-lowering medications may interact with grapefruit, grapefruit juice, pomegranate and pomegranate juice. Select fat-free (skim) or low-fat (1 percent) milk. Avoid milk that contains added flavourings such as vanilla, chocolate or strawberry. They usually have added sugars and calories. Choose fat-free, low-fat or reduced-fat cheeses. Choose soft margarines that contain zero grams trans fat instead of buying butter. Buy and prepare more fish. You should eat one serving of grilled or baked fish at least twice a week. Stay away from fried fish. It’s usually high in fat—often trans fat. Choose lemon juice and spices to eat with fish. Don’t add cream sauces. Choose cuts of red meat and pork labeled “loin” and “round”; they usually have the least fat. Buy “choice” or “select” grades of beef rather than “prime”, and be sure to trim off the fat before cooking. When buying or eating poultry, choose the leaner light meat (breasts) rather than the fattier dark meat (legs and thighs). Try the skinless version or remove the skin yourself. Choose whole-grain, high-fibre breads, such as those containing whole wheat, oats, oatmeal and whole rye. Limit the amount of bakery products you purchase, including doughnuts, pies, cakes and cookies. Look instead for fat-free or low-fat and low-sodium varieties of crackers, snack chips, cookies and cakes. Remember that most store-baked goods are made with egg yolks, saturated fats and/or trans fats. Check for store-baked goods that are made with polyunsaturated or monounsaturated oils, skim or reduced-fat milk, and egg whites—or make your own. “Move More Bermuda” which aims to encourage the public to exercise regularly and lead a healthy lifestyle. “Do you know your blood pressure numbers?” Find out if you have high blood pressure at the free walk-in Blood Pressure Clinic at DoH Hamilton Health Centre on Wednesdays from 2:00–4:00 p.m.
“Cover your Cough”: Reduce the chance of contracting the flu and other upper respiratory infections by frequent hand washing practices, ‘covering’ coughs and sneezes, disposing of soiled tissues and avoiding crowded places. Flu vaccines can be obtained from private physicians or DoH Health Centres. “Sexual Health: Have the Conversation”: Multiple sexual partners put you at greater risk of developing sexually transmitted infections and HIV. There is confidential testing available Monday through Thursday at the DoH Hamilton Health Centre. Call 278-6442 or 278-6487. In a world of uncertainty, where money for charitable organisations is in short supply, amazing things happen when people come together for a good cause. 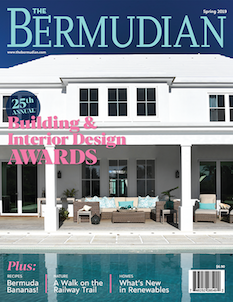 The story of the Bermuda Heart Foundation’s new cardiac center is a perfect example. 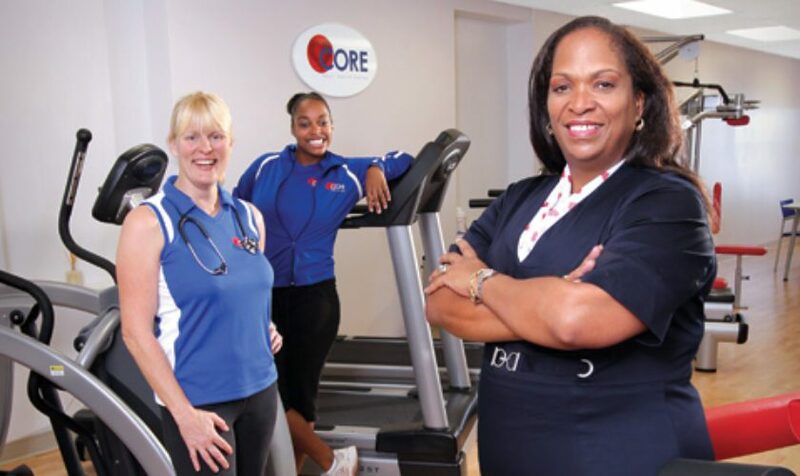 CORE (Cardiac Outreach, Renewal and Education Center) is Bermuda’s first cardiac prevention and rehabilitation center dedicated to making a heart-health difference. The CORE program is an insurable benefit covered by most local insurance carriers. According to the American Heart Association, for every $1 spent on prevention, insurance companies will see a $3 to $15 return on their investment. Clearly, prevention counts. When Simone Barton became its executive director, the Bermuda Heart Foundation had been trying to get a center organised for almost 20 years. When Barton found 87 Chancery Lane, the space was old, faded, dark and not conducive to inspiring good health. She knew there was one person who would understand her vision and be able to bring it together with an extremely limited budget—so she called Colin Campbell of OBMI. Barton was pressed to open the center as soon as possible, but she had little money and less time, so she asked Campbell to put her project in safe hands. Without hesitation, OBMI recommended Rick Moniz of R. Moniz Partitioning and Carpentry, who, along with OBMI interior designers, began the project with a strict budget and schedule. It was truly a labour of love. 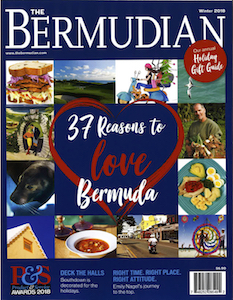 Everyone involved took the project “to heart” and pushed to make it special, knowing they were creating a center to help keep the heartbeat of Bermudians going strong for many generations to come. e team gutted the space and changed the flow to allow more natural light. They added crisp lighting, frosted glazing and strategically placed pops of brilliant colour on a white background to create a sense of vibrancy that inspires everyone who walks through the red doors. This was also a very “green” project; the Foundation repurposed furniture, doors and, yes, even the kitchen sink from local companies that were downsizing. An inspired team delivered this project for ribbon cutting on time and under budget. In addition to OBM and Rick Moniz, the following companies provided valuable assistance to the CORE project: Ernst & Young, ACE, Gibbons Company, Surface Trends, Paget Freight, BAC, Gorham’s, Carey’s Visual Designs and Fibre Net Communications Ltd.